Vegetables can be boring, so I’m always looking for interesting new recipes. 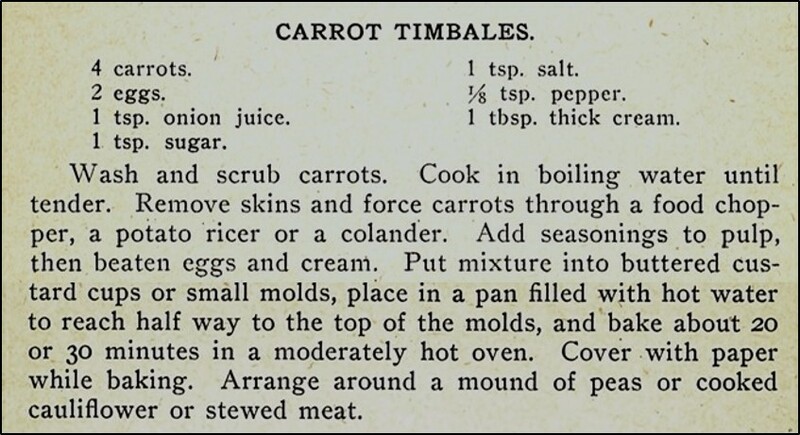 I recently found a hundred-year-old recipes for Carrot Timbales. The timbales are delightfully light, have a texture similar to a custard, and a delicate flavor. This recipe is a keeper, and I anticipate that I’ll be making it again soon. Preheat oven to 350° F. In a mixing bowl, beat together the eggs, onion juice, sugar, salt, pepper, and whipping cream. Add the pureed carrots – a small amount at a time – while stirring constantly. Beat until thoroughly combined. Put the mixture into greased custard cups, and place in a pan filled with hot water that reaches half way to the top of the custard cups. Put in oven and bake until the mixtures has set – and a knife inserted in the timbale comes out clean. Remove from oven. To remove the timbales from custard cups, gently loosen each timbale from the custard cup using a knife or spatula, then flip onto a plate and serve immediately. If desired, may be served with peas, cauliflower, or stewed meat. I used only half as much salt as the original recipe called for. One teaspoon of salt seemed like a lot, so I instead used 1/2 teaspoon. Posted on October 7, 2018 October 7, 2018 by SherylPosted in FoodTagged carrots, recipe. It’s a very tasty recipe. That looks a keeper – though I can’t agree that veg. are boring! I’m always looking for ways to make vegetables more interesting. I think that you’d like this recipe. Yum! When a cooking store was going out of business my mom got me a wooden timbale mold. Until now I had only used it to mold rice. Sounds like you made a wonderful find. There may be several types of timbale molds. The molds that are used for this recipe need to be oven-proof and need to be able to withstand being surround by hot water. I used glass custard cups for the mold when I made this recipe. The consistency of the mixture that is placed in the molds is more like the consistency of a fairly thick pumpkin pie filling before it is cooked – and won’t hold its shape until it is baked. They do look good. I imagine the timbales would make a great presentation at Thanksgiving. It is hard to come up with something different for that holiday because the main course is always turkey. Thanks for finding that recipe. They would be lovely for Thanksgiving. I haven’t seen this in a long time. and now am wondering why, as it is a very tasty and elegant side dish! It’s always fascinating to see how some dishes are trendy at one point and lose their popularity at another. Like you, I sometimes can’t quite understand why some foods go out of style. 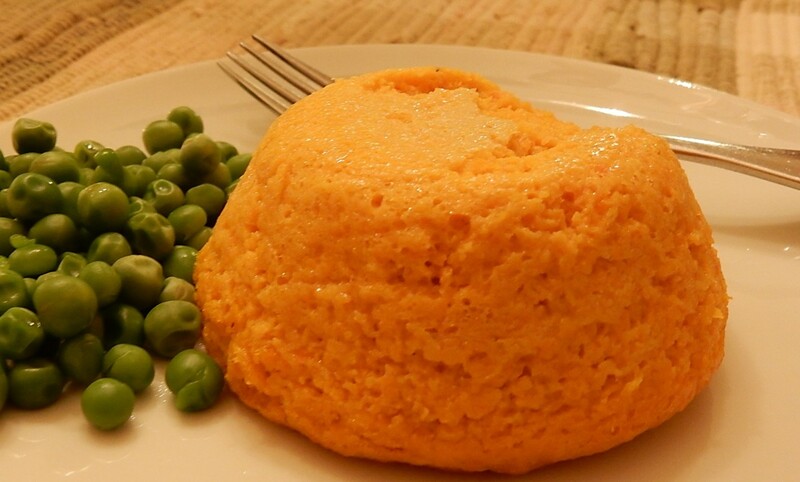 Carrot Timbales are a winner, and it’s too bad that they are less popular than they once were. I will keep it in mind and hope to try it soon. Sounds like another winner Sheryl. They sure knew how to eat back then!! Oh wonderful! We love carrots around here.. I’m going to give this recipe a try as it will also be easy for Leona to eat! This would be a perfect recipe for her. The dish has a custard-like texture. They’re so pretty! And it does sound like a great way to use carrots. They do look nice. I worried that I’d have difficulty getting them unmolded, but all went well. This is a keeper!! Thank you.